Today was the Wisconsin Quilt Expo in Madison, WI. We go every year, and since it’s just a short drive (about 45 minutes), we like to make a day of it. I’ve been to many quilt shows, from local events to the International Quilt Festival when it was in Rosemont, IL (Chicago area). This is one of my favorites because it’s big enough to make the trip worthwhile, and small enough that you don’t feel like you have to rush to see everything. Although the quilts on display and the vendor booths were still heavily skewed toward very traditional styles and color palettes, there was a definite increase in contemporary palettes and designs. While this show is also by far the best in quality of food available, it’s still expensive. So of course we took folding chairs and a card table, packed a cooler and went out to the van for lunch! We parked in the shade of a tree and set up the table on a grassy patch. We had sandwiches, chips, veggies and some truly awesome toffee cracker things by Jeanne, then did a quick show and tell before we went back inside for round two. I’ll get back to the sampler tomorrow – I’ll show you the newly updated (thanks to your input) white and bright version and start providing basic info so you can plan yours. 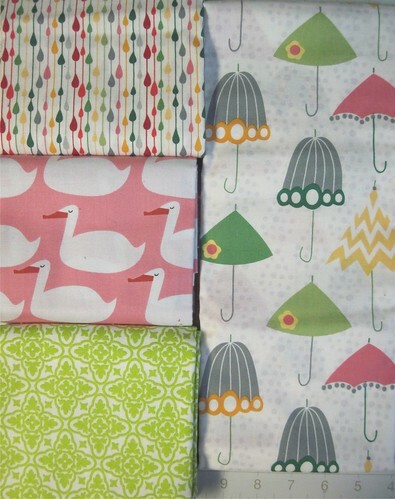 I won’t include the green in a project with the others, but I like the raindrop, umbrella and duck prints together. The green is 7872 Luna by Gail Fountain for Maywood Studios. The raindrops are pattern C4012 and the umbrellas are pattern C4010, both from Rainy Days and Mondays by melimba & beccabury for Riley Blake Designs. And finally, the duck print is from Red Letter Day by Lizzy House for Andover Fabrics. 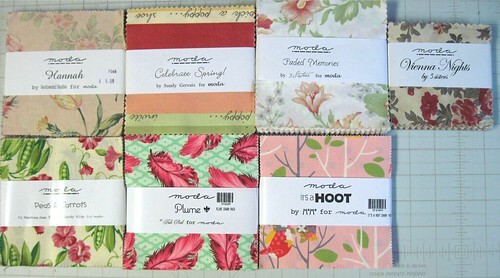 That’s Plume by Tula Pink, It’s a Hoot by Momo, and Giddy by Sandy Gervais, all from Moda. Which brings us back to the gifts! A few things about the giveaway – this is a thank you to my readers, so please don’t publicize the giveaway. I want the gifts to go to people who stick around, not just drop in. The giveaway is open to everyone, not just US residents, and I will draw the winners next Saturday, September 17. To enter, please list your three favorite charm packs from the photo above AND tell me what project you’re working on right now. If you’re working on several, tell me your favorite. Previous “No reply”? No kidding! I lie the Hoot, Hannah and Summer night and right now I’m working on some braided table runners from Jinny Beyer’s line. I like Hoot, Hannah and Plume. I love reading your blog, you have so much great information. I am working on an HST quilt for my sons 8th birthday in a couple of months. Its’s all blue and white and already its one of my favourites! Right now I’m working on a little wall hanging called Spotty Hen. It’s wool applique on homespun, a Hen looking down at her chick, flowers and vines around the outside! My favorites are Peas and Carrots, Plume and It’s a Hoot! I wonder if I saw you there today! I completely agree about the palettes and patterns of the exhibition quilts. And $3.50 for a soda – that’s a fat quarter and a half 🙂 Love those Nancy’s Notions scores. I grabbed some Christmas prints for stockings at Janie Lou’s booth. As far as the charm packs, I think I’d have to say It’s a Hoot, Plume, and Celebrate Spring are my favorites. Right now I’m working on a stack and slash/wonky/deconstructed 9-patch quilt for my parents using Going Coastal. The Quilt show sounds like it was a lot of fun and great fabric scores. I think you have a theme going with the rain, umbrellas and ducks! The Test Your Skills Sampler looks like it should be so much fun! I just joined in on Lily’s Quilt’s Dead Simple Quilt although my favourite current project is a flying geese quilt. All the charm packs look so interesting. I would love to win It’s A Hoot, or Celebrate Spring, or Vienna Nights.I like the idea of a 4″ charm. Thanks for a wonderful giveaway. I like Plume, Celebrate Spring and Faded Memories. I am putting a border on a quilt for my niece for Christmas. Congratulations on 2000 commments! First congratulations on your milestone postings. I have several things going on, so I’ll pick the one I was just working on which is a Cactus Flower paper pieced project, next is a disappearing 9 patch. You don’t want to know what else there is….. The charm packs are all great, but my favorites are: Plume, Peas and Carrots and Celebrate Spring. I like Plume, Faded Memories and Hannah…. Thanks and congrats on 2000 comments! Congrats on such a great milestone! Sounds like you had a great time at the Quilt Show. I am working on a Bliss quilt using the Wild Things pattern. About to piece the back today. My fav packs are Plume, Celebrate Spring and Peas and Carrots. My favorites are Hoot, Celebrate Spring and Plume. I am working on several projects, but my current favorite is my Flurry Christmas quilt. I already made 12 of the 16 blocks in 2 sittings, and am supposed to hold off on the last four because I’m trading four with my friend. But I’m just dying to knock 4 more out and start on the sashing. Wow, that’s a serious charm pack haul! My 3 favorites are definitely Vienna Nights, Faded Memories, and It’s a Hoot. I’m currently working on a quilt for my husband, and I just started a hexagon quilt last week – it’s definitely captured my interest. A better question would be what am I not working on right now. 🙂 My favorite project though is a baby quilt for my first niece. I’m just about to start the machine quilting! Thanks for the giveaway! My favorite is “It’s a hoot!”. I love all of those fabrics! But I also like Plume and Celebrate Spring. So cool that you can keep track of comments. I never thought to do that. Someone else today gave kudos to frequent commenters. So nice! Um I like It’s a Hoot, Vienna Nights and Celebrate Spring. I am currently working on deciding what to work on. We just moved and I am just now unpacked enough to sew. I think I will be doing my kids’ doll quilts and a tooth fairy pillow for a special friend I left back in Texas. Ps love the blue/green color pallete. My fav so far. Its a Hoot!, Peas and Carrots, and Faded Memories. 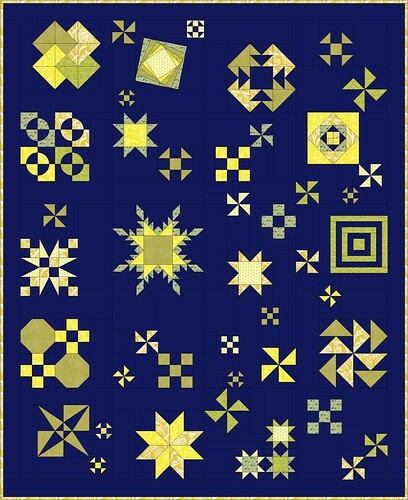 Currently juggling several projects, most emphasis on a strip exchange that I’m making into a spools quilt for my studio – design by Edyta Sytar with a few personal tweaks! Congrats on 2000 comments!! My fav 3 are Peas and Carrots, Celebrate Spring, and Plume! At the moment I am working on a quilting from the Schnibbles x 2 book for my mum for Christmas. What great finds! I’m working on a big quilt for my bed and will hopefully baste it in all its largeness tomorrow! Of the charm packs, my favorites are It’s a Hoot, Plume, and Peas & Carrots. Congrats on reaching 2000 comments! You got some great deals! I hope I can find some equally good ones in a few weeks at the AQS show in Des Moines. I don’t know what is up with the food vendors! Last year it was $9 for a sandwich. That’s a good bit of fabric! I think the idea about repeating skills in the sampler is a good idea. Trying something once isn’t quite enough to feel comfortable with a technique. Sandi – I LOVE that green fabric. That is just the kind of fabric I would buy for myself and receive a whole bunch of scrunched up faces about it. So I fully support your choice! I am currently working on a twisted nine patch using Sandy Gervais fabric and some fabric from my stash. I have several others quilts sitting there waiting for me to get them on the frame and quilted. Thank you for opening this to other areas then the States. It is really disappointing when I look at a contest and find that it is only open to the states. My favorite are Faded Memories, Peas and Carrots and Hannah (my granddaughters name). Holy Moly $5 charm packs!! Charm packs are at best $12 here but usually $15 or even more. So thank you for sharing the love!! I also like my giveaways to be a reward for people who stick about so great choice! I like Plume & It’s a hoot for certain best. I’m not familiar with the other ones, but I have a daughter called Hannah so perhaps that is a fitting choice. Gosh what am I working on at the moment – more like what am I NOT working on LOL… I have about 4 quilts in progress. My favourite would have to be my “cheeky quilt” though. I decided on a whim to ask if any of my blog readers would like to make me a scrappy log cabin block for a king size bed quilt that I’m making myself because I needed 49 15inch square blocks and I really lack time eek. Much to my amazement it looks like I am going to receive about 40 or more blocks from all over the world. How awesome! What a special quilt this is going to be!! I am going to somehow embroider or name each block with the makers name & country so that I’ll forever know how much love went it to it and who made what. I’m hoping to have it finished in November for my birthday. It’s going to be amazing!! Hi Sandi, I’m not here for the charm packs as I am currently struggling to find a home for all my fabric (!) 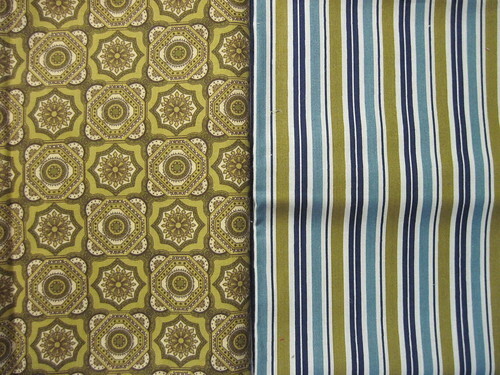 but just to congratulate you on 2,000 comments and to say what fun these samplers are in all the different colourways. 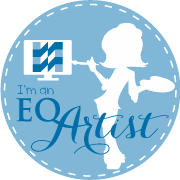 I now have EQ7 and am plodding through the lessons whilst my 9 year old daughter is designing amazing quilts by just playing with the programme because of course she’s young and I’m old LOL. Hello, my friend — how nice of you to have this giveaway. I like Plume, Vienna Nights, and Peas and Carrots. Presently I’m [still] working on my Prairie Women’s Journey Two first project and that blasted Schnibble; today I’m going to start a baby quilt using a variation of the Pinwheels from Emily Cier’s book and THAT will be my favorite because I’ve been wanting to do this for many months! Faded Memories, Celebrate Spring, and It’s a Hoot! are my favorites. What a nice giveaway for us to celebrate YOUR milestone! Thanks for the chance to win. Right now I’m working on several projects, but the one I’m most excited about is a quilt for my daughter ( the first). It’s funky and purple and periwinkle and blue and black. I think she’ll like it, hope so anyway. Congratulations on your milestone, Sandi! How generous you are with your chair pack giveaway! If I were to win, I would prefer Peas and Carrots, Plume and Hannah. I am working on finding a border for my spiderweb quilt, as you know! And thanks again for your amazing help – I will be posting about those EQ designs very soon! I hope i’ve been here long enough to be eligible! I love the look of “Plume”, “It’s a hoot” and “Peas and Carrots”. 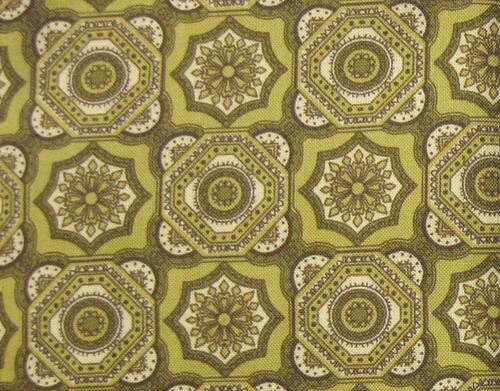 I love the “ugly” green fabric, too…you could get some really cool patterns forming with unusual fussy cutting. I love Hoot, Plume and Faded Memories. I am currently working on an Underground Railroad in batiks and way too many applique BOMs. I also have a tumbler quilt started that will be a charity quilt to get rid of the 30s fabric that continues to multiply even though I have made 3 quilts with it already. Congratulations on your milestone! I would love to win one of these. I like “Plume”, “It’s a Hoot”, and “Celebrate Spring”. Currently working on a commisioned memory quilt that is going well now that I am paper piecing it. Congratualations on the 2,000 comments. A milestone for sure. I like Hannah, Faded Memories and Plume charm packs. I am currently working on a paper pieced table runner and a three charm pack quilt. Thanks for the chance at your giveaway. Current project – I need to clip some threads (ok, a lot of threads) off the back of a quilt front before basting. My first twin size – years in the making! Nearly ready for basting! Someone get me up there to clip those threads to get it on it’s way to an FO. I love American Jane/Sandy Klopp – that’s definitely my favorite. My other faves are Faded Memories(those 3 sisters keep drawing me in) and It’s a Hoot. Well, I guess the comment I just typed just disappeared into La-La Land. So, my three favorites? The entire bottom row – Peas & Carrots, Plume and It’s a Hoot! Congratulations on such a monumental milestone! And thanks for the giveaway. And what am I working on? Well…actually, at this point in time, I’m not working on anything. I took a bad tumble down the stairs on Monday and badly sprained my ankle. So I’ve been keeping my foot elevated all week. But prior to the fall, I was working on three charity quilts and picking out fabrics to send to a friend in Texas for a quilt her mom is making her. Congrats on your 2000 milestone. I so admire your work and your willingness to share. Wonder how you find time to do everything! The It’s a Hoot, Plume and Hannah are my favorite packs…as well as the prices you get them for. Unheard of here. 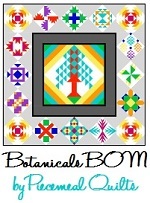 I’m working on a BOM from The Quilt Show….a little behind as I’m still doing May. Also making some microwave potato bags for Xmas pressies. Just finished a tree skirt for DIL’s gift. My other project has been to re-arrange my quilting space, which has given me fresh energy to do more projects. I’m currently working on a zig zag quilt for the Linus Project and loving every minute of it! I was quite shocked to learn that I left comment # 2,000 and I’m waiting to see what my gift is. 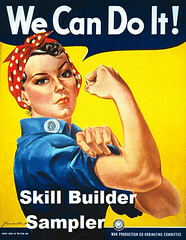 A little clarification: I’m commonly known as SusanB of Handcrafting with Love. SusanBLuvsCrafts is my WordPress (and Ravelry and Flickr) user id. The “SusanB Luvs Crafts” page gets you to my website, blogs, and the other sites I hang out. Since I’ve already won a gift from Sandi, I’m not vying for a 2nd one. But I will answer the giveaway questions. My charm pack favorites are: Plume, Peas & Carrots, and Faded Memories. I don’t have any active quilt projects, but I’ve been making patchwork fleece blankets from a small mountain of scraps. I just finished my 48th hat to go to City Union Mission in Kansas City for the winter holidays. (Most of the hats can be seen in my Ravelry projects and Flickr photostream). And I started crocheting an afghan this morning. Congratulations on 2000 comments – how lovely! I am a newbie quilter and prefer modern quilts to more traditional ones but baulk at using white in my quilts too. So far my choice has been blue – navy or indigo! Favorites are Peas and Carrots, Vienna Nights and Celebrate Spring. I am working on getting caught up on block swaps! Almost done. Thanks for a giveaway for your readers. I like Plume, Hoot and Celebrate Spring! the best. I am slowly but surely working on a twin quilts made from vintage sheets-some are from my grandmas, others from my childhood and some I bought. Congrats on the personal milestone and thank you for all the quilt inspiration you continue to provide. This is the summer of my first solo quilting. Previously I only ever helped my Mom and that was mostly with cutting and hand quilting. I never did any machine work. So this summer I took a week’s vacation to make my very first quilt top – a full sized one in an easy pattern with little seam matching involved (I have a machine that makes quarter inch seam accuracy a challenge). The experience has been immensely satisfying! I have since made two baby quilt tops and and am half way through hand quilting one of those. I still can’t claim a “finish” though I hope to next week. Since I’m newish to this, I’m also trying to build up a bit of a stash to work with and to feed my imagination so any of these would be fabulous. I like the Faded Memories, Hannah, and Plume. My current project is a cross stitch blanket for my nephew. I’ve been working on it for about a year now (!!!!). I’m hoping to finish it soon, send it off, and focus on other projects that have been calling my name! I love Giddy and It’s a Hoot. I am not working on anyting at the momemt- suspended animation has set in as my daughter is getting married in just over 4 weeks- I had 6 weeks notice. Whew! But it is all going together. So instead of a year of stressing, I got 6 weeks of stressing. Right now I’m working on multiple projects, as usual. I’ve got a French Braid quilt in progress, using red as the accent and blue, green, aqua, and yellow as the strips. It’s coming along nicely. I’m also working on my second One Block Wonder, using Maxine Rosenthaal’s technique. The original fabric is a scene of a wintery village, and it’s starting to look a lot like snowflakes. The third thing I’ve got on the go is a traditional kaleidoscope block quilt for my BIL using black, red, orange and grey. Finally, I’ve got a baby quilt in the planning stages for a friends of mine who’s having her third child in February. I think I’ll be busy for awhile. I can’t really pick a favourite project though. I love them all for different reasons. The three charm packs that are my favourite are: It’s a Hoot; Giddy; and Peas and Carrots. My favorites are Celebrate Spring, It’s a Hoot and Plume. I’m working on a couple of baby quilts. I was just wondering if you have any Plume left that you would be willing to sell? It ca,me out before I started quilting and it’s just so hard to find!